This is a Doctor Who scarf for Season 12 worked in single crochet (U.S. terminology) with DK and sport yarn using a G hook. Foundation chain is 36 giving an approx. 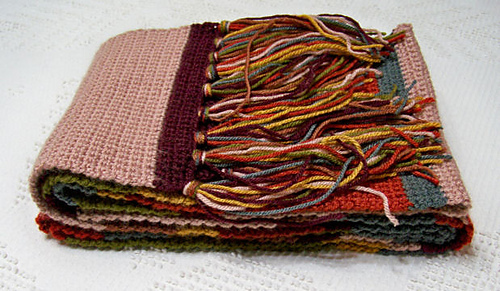 8” wide scarf. Inches for each stripe of color are given per doctorwhoscarf.com . Gauge is 5 rows to the inch for this yarn and my tension. If you use different yarn or have different tension, you may have a different gauge. I used 2 skeins of almond and 1 skein of each of the other colors though I used almost every bit of the paprika. If you want a wider scarf (as the original) you will need 2 skeins of each and possibly 3 of the almond. There are 7 colors used. 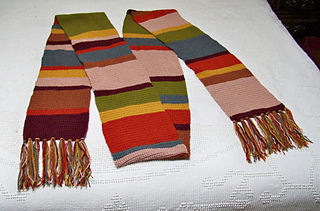 To make this scarf to look like the original Doctor Who Tom Baker scarf you have to use 7 colors. These colors are the most accurate I have found at this time but manufacturers change, colors become discontinued, better colors are found etc so no guarantees of that over time. I used a fringe making tool and set it to 6”. If you do not have a tool, you can make 12” strands, one of each color for each fringe needed. I placed 9 across.